Boston, MA - Kyruus today announced key findings from a recent survey of 1,000 consumers on how they search for, select, and schedule appointments with healthcare providers. 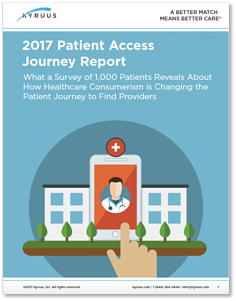 The findings, published in the 2017 Patient Access Journey Report, indicate that the majority of consumers consult the internet in the search for a new provider, yet most still prefer to schedule appointments by phone. In addition, consumers take a wide variety of factors into account when considering potential providers. The results demonstrate that while health systems must enhance their digital presence to provide consumers with the information they seek online, they must do this as part of an integrated, multi-channel patient access strategy. The findings show that today’s empowered consumers are taking an active role in their healthcare decisions and performing due diligence on providers. In fact, the data reveals that even when consumers receive a referral for a specialist, 90 percent always or sometimes still conduct research on providers before scheduling with them. Despite the fact that consumers value hospital/health system affiliation (three out of four said it was extremely or very important), only a small minority start their provider research on hospital/health system websites—the largest share start with a general internet search. This underscores the need for health systems to invest in their websites and digital strategies to attract and engage new patients online, as well as retain existing ones. Consumers consider ‘insurance accepted’ the most important factor when selecting a provider, with three out of four rating it as extremely important. Relevant clinical expertise was the second key factor (53 percent). Four out of five consumers cite appointment availability as a key factor when selecting a provider and over 60 percent have searched for an alternative provider to obtain an earlier appointment. Overall, 62 percent of consumers prefer to book appointments by phone, citing speed of booking and personalized service as the top two reasons. Convenience is key for millennials. 79 percent have continued their provider searches to look for an earlier appointment and two out of five prefer to book online, indicating that pressure on health systems to enable and enhance online scheduling will only rise. Kyruus conducted the survey of 1,000 consumers, who spanned four key age groups ages 18 to 65 plus, in partnership with Wakefield Research in July 2017. All respondents searched for a healthcare provider for themselves in the last two years.